As well as the main therapies of Chinese Medicine, there are a number of supportive techniques. These can be used alongside therapies such as acupuncture or tui na to reinforce or supplement the treatment. 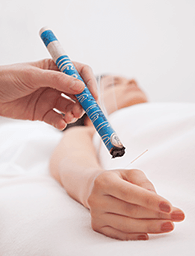 Moxibustion has the effect of stimulating circulation and healing, warming the body and dispelling Cold. It is especially useful for people and conditions which are worse in the cold and respond well to heat. It is commonly used for pain, infertility, and weakness or lack of energy. It is also used during pregnancy for breech presentation and is an essential component in many of the traditional techniques for health maintenance. It is very pleasant and relaxing to receive. Qi Gong (or ‘Chi Kung’) is the name for the self-cultivation exercises that form an important part of Chinese medicine – T’ai Chi is one example. If you are interested in learning some Qi Gong exercises as part of your treatment, then I’ll be happy to show you some that you can practice at home. It may also be worth discussing and practicing some of the basic parts of Qi Gong, for instance some deep breathing or relaxation exercises. Another common accompaniment to acupuncture or tui na is cupping. This ancient technique involves the use of glass or plastic ‘cups’ which are placed onto the body having first created a partial vacuum inside using a flame or a suction gun. This causes the cup to stick to the body and provide a gentle suction. The effects of this technique are to strongly stimulate circulation of the area and relax tense muscles. It can also be used to ‘draw out pathogens’ in the case of common cold, flu etc. especially when used on the back. There are a few ways to use cups. Stationary cupping involves placing the cups and leaving them in place for a while. Slide cupping involves putting the cups on the body with a little oil and sliding them from one place to another to cover a larger area. Finally, flash cupping is where the cups are placed on the body and then quickly removed, in order to provide a milder stimulation. Gua sha or ‘scraping’ is less commonly practiced by Western therapists, but has always been an important therapeutic technique for Chinese medicine practitioners. It is used by tui na practitioners more than acupuncturists though it makes a useful adjunctive technique for either therapy. First of all a little oil is applied to the area to be treated, and then a special tool is used to gently scrape the skin until a Sha forms. The Sha is a red, rash-like appearance on the skin which indicates that the gua sha treatment has been effective. Although it looks like a strong treatment, gua sha is not unpleasant to receive. Gua sha is used where there is stagnation, and can often be helpful for pain.